Small space but still want to grow potatoes? Growing in a potato tower is an easy option. I will show you how to make and grow in a tower that will have you wondering why you did not try it sooner. I am always so happy when it is time to start growing again. It always feels like winter lasts forever! 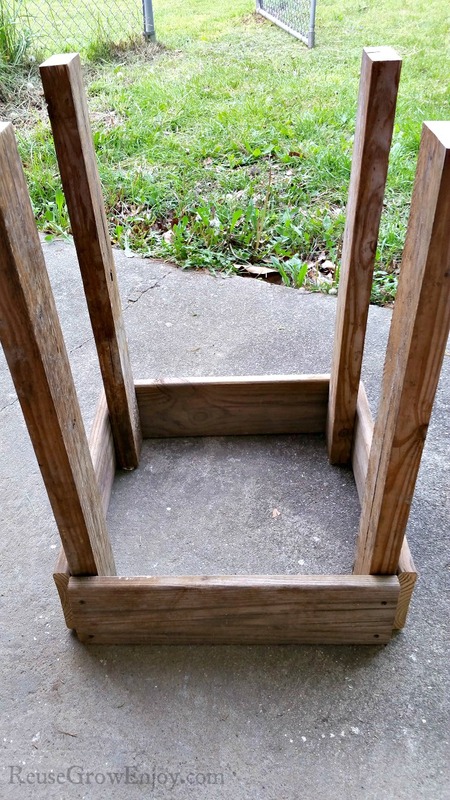 If you are ready to jump-start your garden season too, this DIY potato tower is a great place to start. Out of all the ways I have grown potatoes, I think this is my favorite way. Not only is it a great way to grow lots of potatoes in a small space, but it also looks really pretty too. 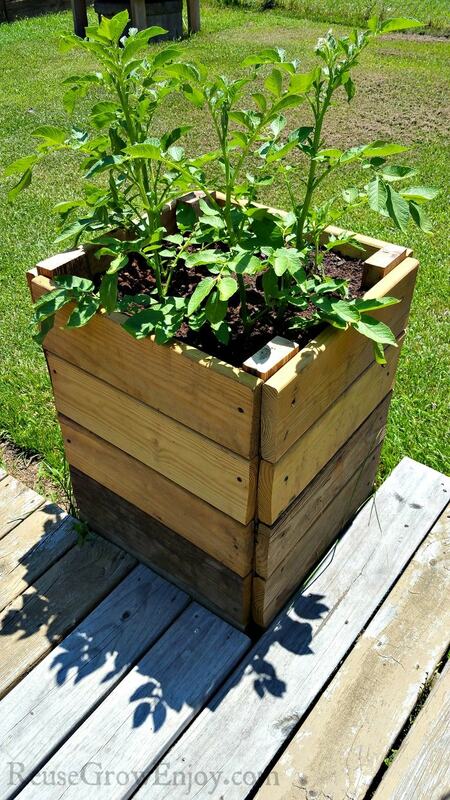 Below are all the details you should need to make this easy DIY potato tower box as well as tips for growing in it. If you have any questions, feel free to ask them in the comments below. You will need four boards like 2×4 that are each about 28 inches long. You will also need 20 boards (used decking boards) that are about 18 inches long. It really does not matter if they are slightly longer or shorter, you just need them to all be the same length. 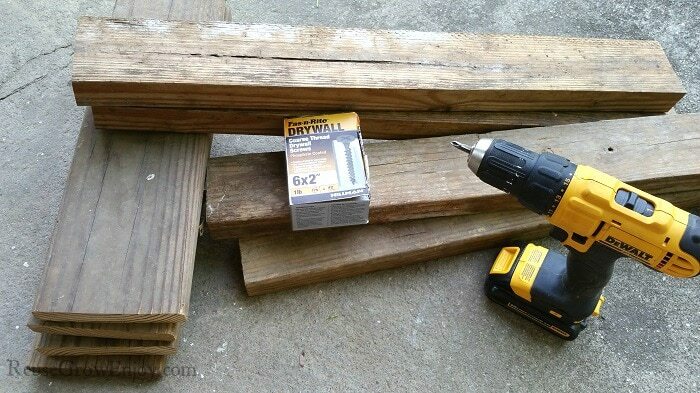 If you use boards that are not as wide as decking boards, you may need a few more. You want to be able to stack them over each other so they cover the full length of the 28 inches long 2/4’s. If you do not have boards already in these sizes, you will also need a good saw to cut to the right length. 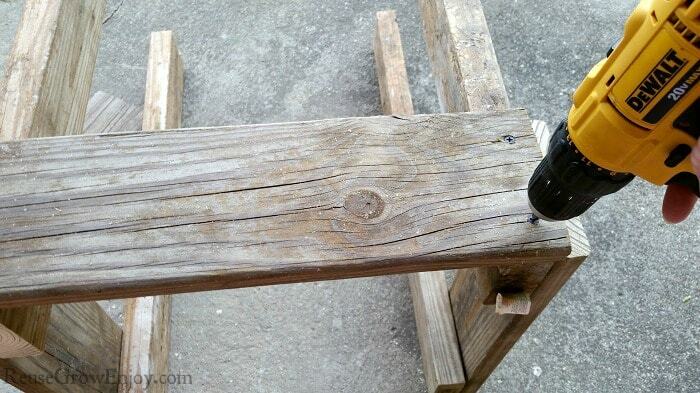 A circular saw or table will work just fine. You will also need a drill and some screws. While you can use any screw, I find that drywall screws work the best. They only need to be inch 1/4 to inch and half long. 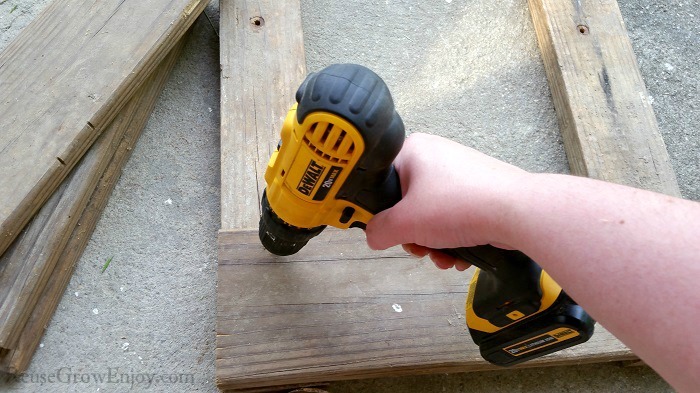 The first thing you need to do is lay two of the 2×4’s down flat. Then lay one of the 18-inch boards over them all the way at one end. You want the board to just reach the outer edges of each of the 2×4’s. Screw the decking board to the 2×4’s. Then do the same thing with the other two 2×4’s. After you have one board attached to both sets of 2×4’s, you need to join each of those together with another 18-inch board. These are the trickiest and hardest ones to attach as you have to kind hold things together and screw at the same time. 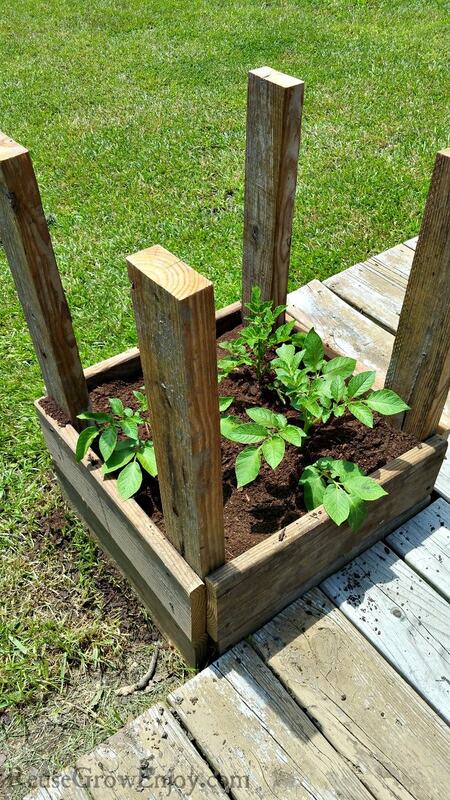 After you have them all attached, figure out where you will place your potato tower to grow and move it there. Then fill it with dirt up to the top of that first board. Your dirt should be a good mix of rich soil and either sawdust or peat moss to help keep it from getting too hard. Then every time your plants get about eight inches above the board, add another and fill with another layer of dirt. You just want to be sure to carefully add the dirt so not to damage the plant. 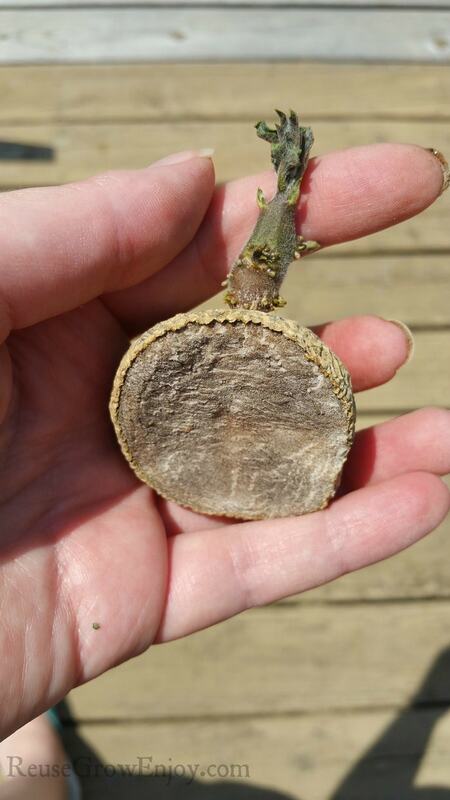 You will be covering the plant with dirt, but you don’t want to break off any branches or the stem of the plant. 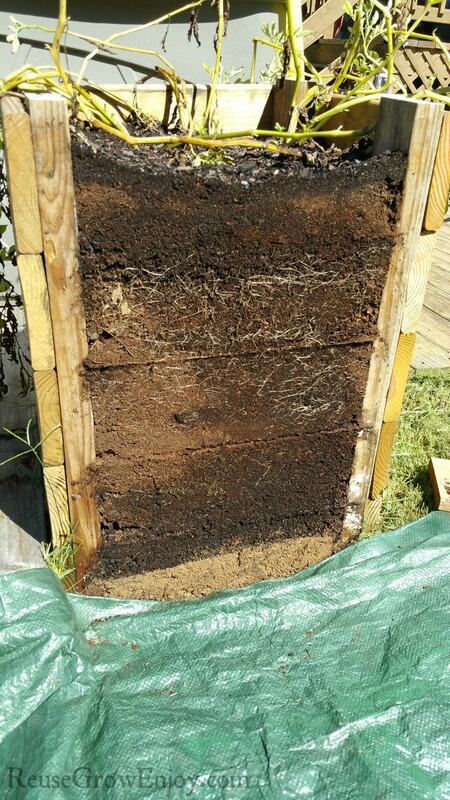 After you have added the last board at the top of the 2×4’s and put that layer of dirt, the tower is now built. Now it is time to just wait to harvest. Have you ever had a potato a little too long and notice they start to grow little sprouts on them? You can use them to make seed potatoes to grow more potatoes. Leave them in a sunny but not hot area until you are ready to plant to allow the sprouts to grow. 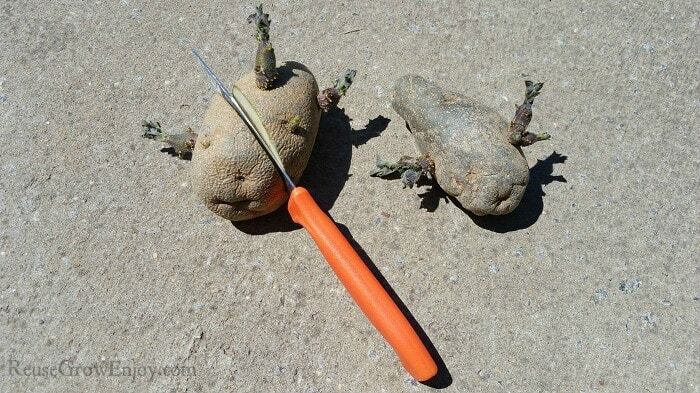 If you have large potatoes, you can cut them into pieces. You want to try and cut them so each piece has at least one to two sprouts/eyes on them. Just be sure not to cut them to small. About an inch or so is a good size to stick to. After you have cut them into pieces, place those pieces in a cool dark area for a day or two before planting. This helps heal/scab the cut so that it does not just rot in the ground when you plant it. After the time has passed, you can then plant your seed potato pieces. 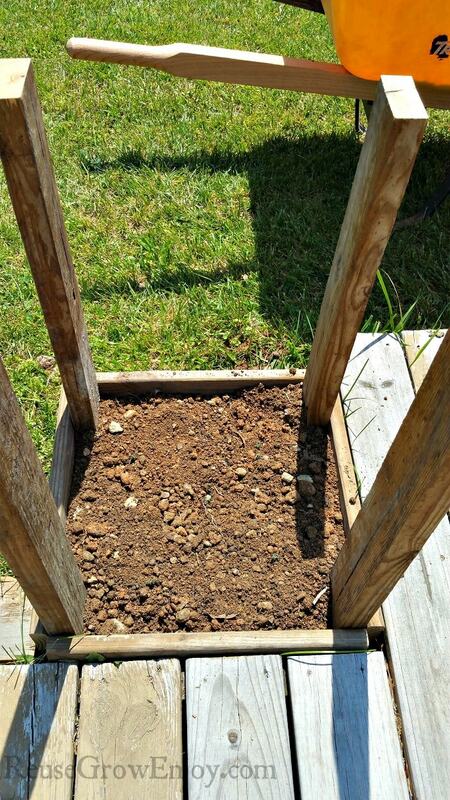 Simply dig a little hole about 2-3 inches deep then place them in the dirt of the box. Make sure the sprout/eye is facing up. Like noted above, keep adding a board and layer of dirt every time the plant gets to be about 8 inches above the board. Until you reach the top. Just be sure when you add layers of dirt, that there is ALWAYS a few inches of the plant that stays above the dirt at all times. 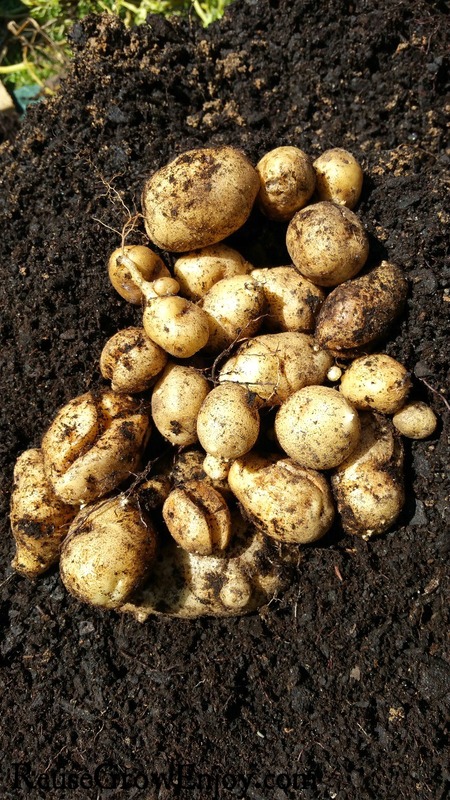 When growing potatoes, there are a few things you should know. First, they do not like the hot heat of summer. So depending on where you live will depend on when you want to plant. You can actually get two growing seasons in one year. That is unless you are in an area like up north where the spring and fall seasons are short. It is best to plant just before the last frost. You can always set jars over the sprouts if there will be a heavy frost. Or to plant just as summer is ending. When growing potatoes, you need to be careful about watering. While the plant does need water to grow and to make potatoes, overwatering can be bad, really bad. 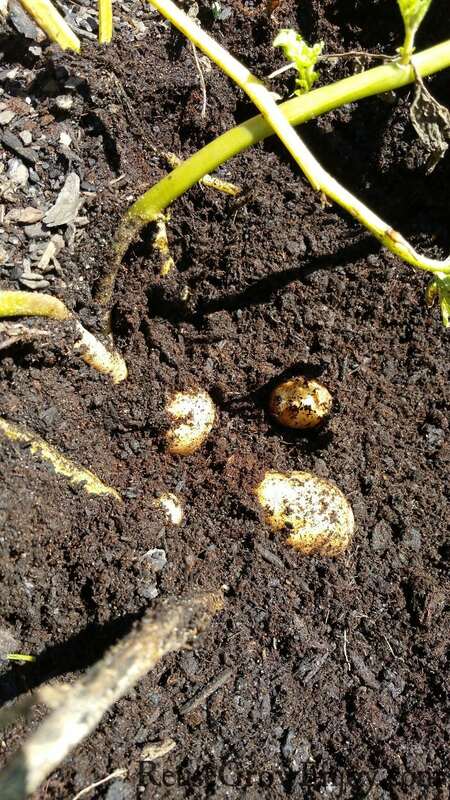 If the ground stays to wet for too long it can make the potatoes rot. If you go through a dry spell where mother nature is not doing the watering job, try and stick with a heavy watering about one time per week. Then before you water, be sure to check the soil first and see if it is still moist. When the plant at the top is dying off at the end of the season, it is time to harvest. The best way I have found to do this so that it is easy to reuse the dirt is to use a tarp. Lay the tarp or drop cloth on the ground on one side of the potato tower. After you have the tarp down, you can start to remove the side boards. You only need to remove the side where the tarp is. After you have the boards off, you can start to pull out the plants and the dirt onto the tarp. As you go, you can sift through and pull out the potatoes. When you have everything out of the box and you have collected all of your potatoes, you can move the dirt. You can pull the tarp to a place you want to store the dirt until the next growing season. After a few seasons, you may want to swap out the dirt from a garden bed. Because if you grow the same plants in the same dirt year after year, it strips the soil and your plants will not do well. 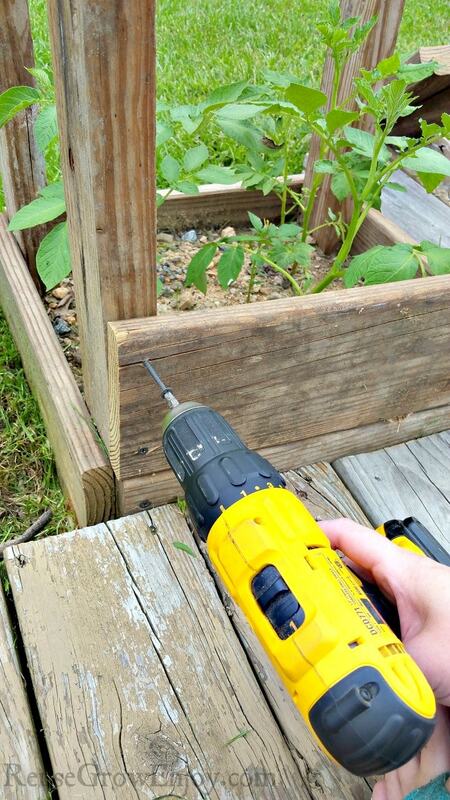 Looking for more gardening tips? Here are a few to check out.